Celine Dion vowed to "always be one" with late husband Rene Angelil as she returned to the Las Vegas stage for the first time since his passing. Her show at The Colosseum at Caesars Palace on Tuesday (23Feb16) began with a montage of family pictures and television appearances of Rene, along with a quote from Celine: "I understood that my career was in a way his masterpiece, his song, his symphony. The idea of leaving it unfinished would have hurt him terribly. I realised that if he ever left us, I would have to continue without him, for him." Celine was then greeted with a standing ovation as she took to the stage to perform With One More Look At You/Watch Closely Now. 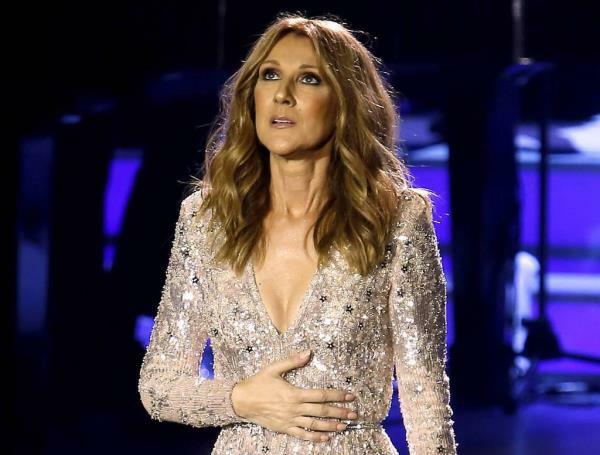 Struggling to control her tears, Celine told the audience afterwards: "Thank you, I did rehearse this song in my closet and it went way better than that. "Through my life, I only had highs from my husband who sat out here night after night. People thought that I was looking at him actually, but I didn't need to because every time I close my eyes I felt René on stage with me whether he was seated in his seat right there, in the balcony, backstage or at home with the kids. He's always been on stage with me. And nothing will ever change that. "You know Rene always surrounded me with the very best people possible. I trusted him so much, that I never had the chance to worry about anything. Now I guess it is only a natural impulse to constantly question myself. Would he let the kids play with these toys and is this song too fast, is this song too slow. Don't talk too much. It is pretty amazing that since he is no longer physically with me he is even more present." The first 20 minutes of Celine's show were streamed live on her website CelineDion.com. The singer looked stunning in a sparkling black gown as she performed her songs, and continued to pay tribute to her spouse with some heartfelt words. "Rene was my very best critic," she said. "He never told me what I wanted to hear, he told me what I needed to hear. You know night after night on our way back home from the show when he was so silent, I could sense that he was trying to know how to approach me without hurting my artistic feeling, but there were things that he had to tell me for my own growth. Rene is the only man that I have known all my life. He always made me feel that we were on our first date, isn’t that amazing? Never talking bluntly, and always impressing himself in a soft and gentle way. We were one. And nothing has changed we will always be one." "You know I might not hear his voice yet, but I talk to him. I think of him all the time. I feel and I know he hears me. One way or another, I know he will give me a sign, for his approval or not. And now I can feel that he's telling me to zip it and start singing. Thank you so much for being here." Celine is also said to have continued with a tradition she and Rene had before her shows prior to returning to her residency on Tuesday night. A source told E! News that Celine and Rene used to hold hands before she headed to the stage. In order to continue doing this, Celine had a mould made of Rene's hand and had it covered in gold so she is able to continue with this pre-show ritual. Rene lost his battle with cancer on 14 January (16). He was laid to rest at the Notre-Dame Basilica in Montreal, where he wed Celine in 1984.